Are you looking for a new house to own or a new property to purchase for investments? You may want to consider buying a foreclosed properties or bank-owned properties. Foreclosed properties are often discounted in prices. 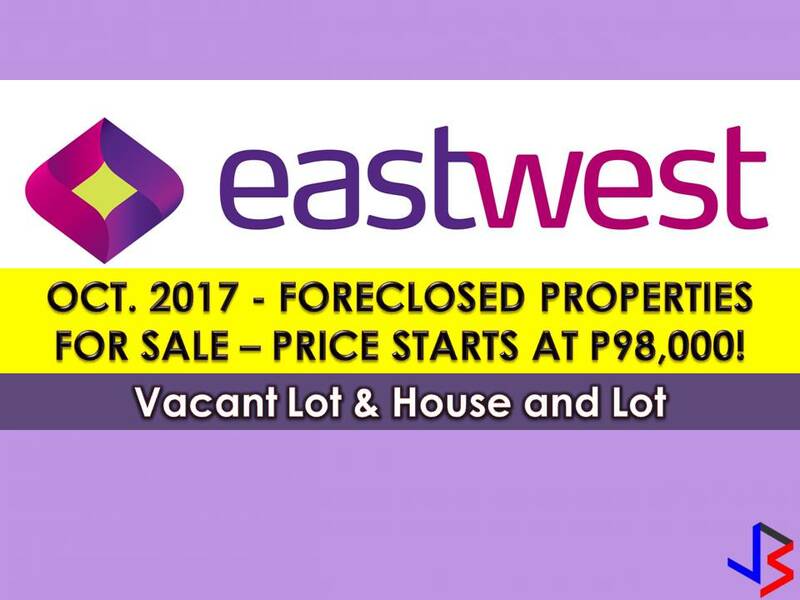 The following "properties for sale" are taken from EastWest Bank website. This includes residential, agricultural lots, house and lots, vacant lots, condominium properties, a memorial lot, and many other. If you are lucky enough, you may be able to purchase a house or any property at a lower than a market value price. If you are interested in the properties listed above, you may contact directly to the EastWest Bank for questions and inquiries. DISCLAIMER: We are not affiliated with EastWest Bank and all information in this article are taken from the bank's website for information and general purposes only. Any interested party for this foreclosed properties is advised to contact directly to the bank or contact information listed on this post. Any transaction you entered is at your own risk and account. Here are the complete list.